The largest Pet Door that can be installed into glass. Its extremely slim profile eexterior frame also means that this Pet Door can even be installed into sliding glass patio doors. 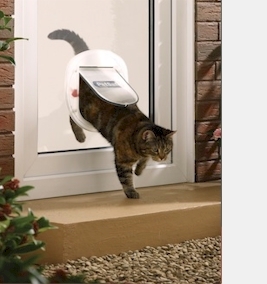 Also suitable for regular doors and surfaces, this Pet Door features the 4 way locking option. The 4-Way lock allows you to choose from four access options to control your pet’s access in and out of your home: open, locked, in-only or out-only. Open allows entry or exit; Locked does not allow entry or exit; In Only allows entry but no exit; and Out Only allows exit but no entry. Available in frosted and white finishes, it is suitable for cats and small dogs up to 10kg.